Burton Humphrey Ruggles first wife was Anna Halladay. Her brother, Daniel Halladay, was the inventor of the the first fully self-regulating windmill which helped enable the development of the American West. 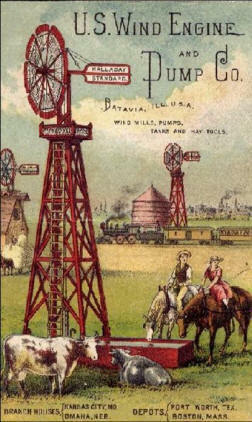 Burton worked with his brother-in-law, first in Connecticut where Daniel started manufacturing his invention in 1854 and later in Batavia, Illinois where the US Wind Engine and Pump Company was moved in 1863 to take advantage of the growing western market. Burton Humphrey Ruggles was born in 1823 in Royalston, Massachusetts. In 1846 he married Anna Halladay. Burton and Anna had seven children: Mustapha Benton, Gustavas Burton, Emma Ella, Edgar Monro, Frank Leroy, Arthur Herbert, and Anna Jane. Anna died in 1858. In 1867 Burton married Sara Elizabeth Warren. Burton and Sara had three children: Charles Frederick, Lucus Warren, and Hattie Tryphena. This web site tells the story of these families, their descendents and their ancestors.